Vertical blinds are an energy efficient and easy to maintain choice for covering patio doors and large windows. They come in a variety of colors and patterns so you are sure to find one that will look perfect in your room. Vertical blinds are made of louvers or slats that clip onto a sliding track. The blinds are operated by a chain or wand that turns the slats and opens and closes the blinds like curtains. They can be mounted inside or outside of the window frame. Some blinds are strung together with a chain or cord through the bottom of the slats as well. This helps prevent the blinds from swinging around and running into one another which tends to make a lot of noise. They are a very popular choice for residential and commercial properties because they are energy efficient and easy to maintain. Instead of having to replacing the whole blind, you can just replace individual louvers. However, they don’t have to be a boring feature in the room. You can find blinds that match your style and taste. You can make them a statement feature of the room or have them blend perfectly with your furniture. 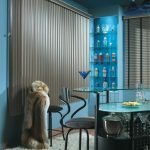 Vertical blinds come in lots of different types of materials which vary in cost and functionality including fabric, vinyl, wood, faux wood, even aluminum. You can also find a wide selection of colors, patterns, or textures to suit your interior design taste or to match the room. They are great choice for large windows and sliding doors where other types of blinds would be too big or bulky. Horizontal blinds would require you to open them all the way before you could go through the door which would be impractical and very heavy to lift. Vertical blinds are easy to use and only require you to tilt the blinds and then slide them out of the way. The louvers come in a large variety of widths, which makes them great for covering large spaces. 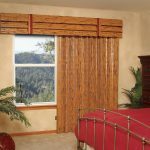 They are also the perfect solution for covering a curved, split drop, or sloping window because you can cut each blind to fit the whole window perfectly. You can adjust the material to fit the needs of the room. You can look for flame retardant louvers for the kitchen that are are easy to clean. Moisture resistant materials would be great for the bathroom as you don’t have to worry as much about mold and mildew build up. A good choice for the bedroom would be blackout fabrics. Besides the materials, you can also match the interior design of the room with different colors, patterns, and textures. Easy to use: All you have to do is use the wand to tilt the blinds to let in however much light you want or slide them out the way. Energy efficient: They block sunlight in the summer and help trap heat inside in the winter. Block out light better than horizontal blinds. Collect less dust than horizontal blinds so they don’t have to be cleaned as much. Less expensive than drapes and shades. Easy to replace: You don’t have to replace the whole unit, if one blind gets broken. You can inexpensively replace the broken slat. Noise: Depending of the material. the blinds can make some noise when they swing together when you open or close them. The wind or fans can also make them collide into one another. Dust or Dirt on the Bottom: the bottom of the blind, especially if they are made out of fabric, can collect dirt or dust from rubbing against the floor. Some of this can be prevented by measuring your blinds beforehand to make sure it doesn’t make direct contact with the floor. Woven Wood Slider usually come into two options. One is a large woven wood fabric panel that slides along a track and gently folds like a curtain when you open it. 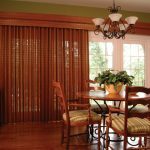 The other consists of separate woven wood panels, sometimes called sliding panel track blinds, that slide along tracks to fully cover a large window or sliding door. The panels move separately so you can easily adjust them to let in the perfect amount of light. They come in a variety of natural woven wood materials, colors, and patterns to choose from to match with your decor. Some options include bamboo, grasses, and reeds. Woven wood sliders are a contemporary alternative to vertical blinds and are also great for covering large windows and sliding doors. They also make great room dividers and closet doors. You could use them as a sleek door for your home office, dining room, or laundry room as a modern option to a classic door. Doesn’t have as many gaps to let in light or make as much noise as vertical blinds. Uniformly covers the window for a simple clean look. Let in a warm glow to brighten up the room. Like most fabrics, they do not block out all light. Depending on what room you are using them in, you might want to consider buying a liner that can slide behind to block out more light when needed and add a layer of privacy. Sliders with a bottom chain are not recommended in homes with children or pets because of the exposed cord. The safer choice it to pick a slider with a wand control option. Need help on deciding what type of window covering or divider will work best for your room? We are happy to help. Feel free to stop by or give us a call to set up for free in-home consultation. Questions? Contact us or call (803)755-3290.